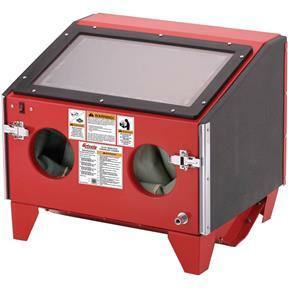 This Benchtop Blast Cabinet features 16" wide doors, allowing easy access, and a 19" wide x 10-3/4" tall window for good visibility. 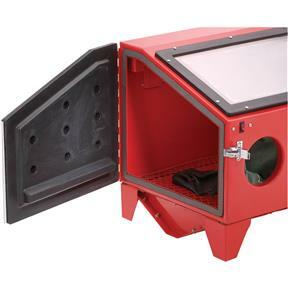 Includes blasting gun with ceramic tips, built-in fluorescent lamp, and sealed glove ports. Air pressure requirement is 100 PSI. Overall size is 27-1/2" wide x 24" high x 22-1/2" deep. Weighs approximately 56 lbs. Bought this for my wife to refinish furniture hardware. Couldn't have worked out better! Very happy with this purchase. 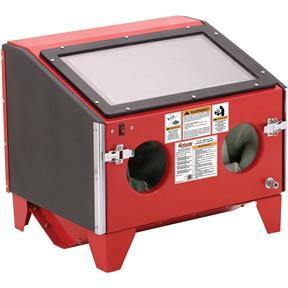 I bought this to replace an old worn out small sandblast cabinet. The Grizzly T27157 is much higher quality and works great. The extra nozzles are great. It's also nice to know I can get spare parts (which I likely won't need for years). FWIW, I'm using a glass bead media. Easy to put together. Does great job of removing rust and old paint. Great price. Very well made. Will try other grizzly products. Get the catalog, full of great stuff.